Listen to "Follow the Money Weekly Radio" on Spreaker. Follow the Money Weekly (or FTM Weekly) delivers fierce truth about global trends along with profitable investment and income ideas. Heard in over 30 countries since 2010, our podcast helps you understand what is truly important about your money. 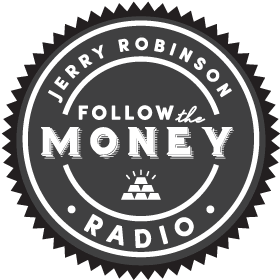 The podcast is hosted by popular Christian economist, investor, and best-selling author, Jerry Robinson, who delivers cutting-edge commentary along with special guest expert interviews. PODCAST: Are You Ready For The "Green Gold Rush"?